This is a piece of law that dates back to the 1940s and still goes wrong - for no reason. It went wrong again on Saturday when the Lions played the Sunwolves. On the Lions 22 and near touch, Sylvian Mahuza of the Lions kicks downfield. After he has kicked, Semisi Masirewa of the Sunwolves knocks him into touch. The ball lands about 14 metres in from touch and five metres outside the Sunwolves' 22. The referee stops play and he and his assistant agree that Masirewa was guilty of late obstruction by charging into Mahuza after he had kicked the ball. The Lions are then offered the option of a penalty on their 10-metre line or downfield where the ball landed. They chose the one downfield and the mark of that was given was a little over five metres from touch. This is vastly inaccurate. The first option should have been on the Lions 22, the second well in from touch about five metres outside the Sunwolves' 22. "Well in" because the ball landed about 14 metres from touch, not five metres from touch. But that is not all. Law 9.25: A player must not intentionally charge or obstruct an opponent who has just kicked the ball. The place where the penalty was given in this case was very wrong, and you can't blame it on a recent change in the law. In 1948, the relevant part of the law read: If the ball alights within 10 yards of the touchline, the mark shall be at a place 10 yards from the touchline on a line parallel to the goal lines through the place where it alighted. 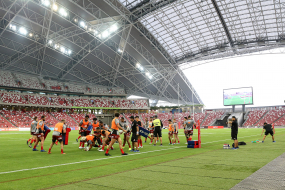 It is certainly not a new law – certainly not new to the 46 players and five match officials in the match between the Sunwolves of Japan and the Lions of South Africa. Ignorance of this bit of law is not the law's fault.